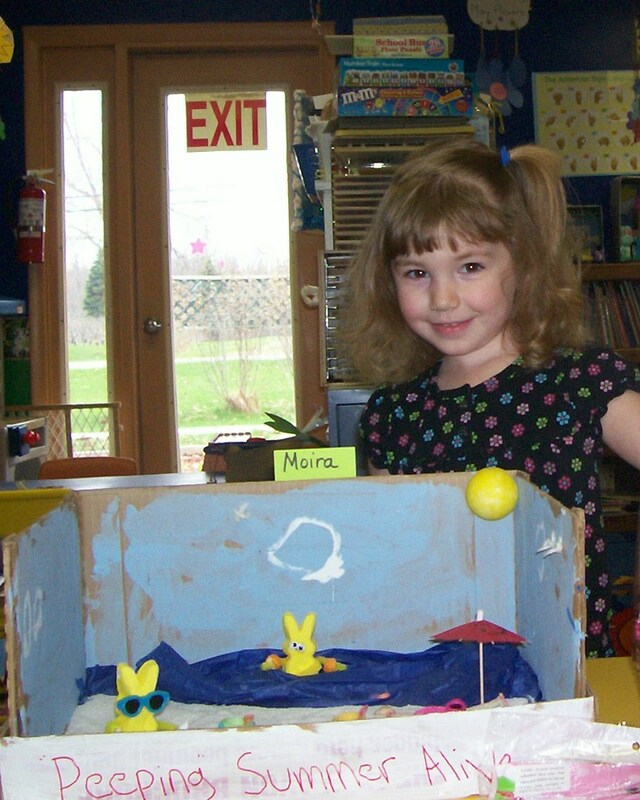 Children from Noah's Christian Nursery School participated in their first family "Peep Diorama" contest. All three classes at the preschool were allowed to enter. Awards were given to the top 2 "peep-oramas" in each class. The "peep-oramas" were on display at the Fulton First United Methodist Church, during their recent Easter Egg-stravaganza. 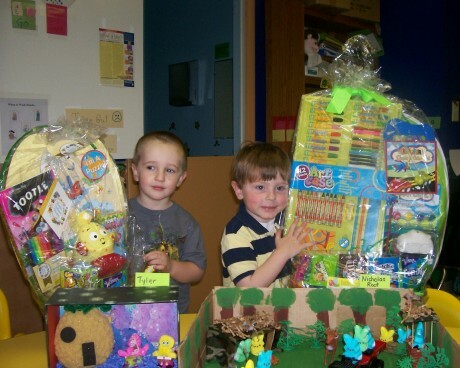 Individuals who attended the Easter Egg-stravaganza voted for their favorite "Peep-orama" Moira Spiegel a student in the afternoon Loveable Lions class was the over all winner. Moira is in her first year at the preschool and enjoys painting and learning new things. Moira's diorama stood out amongst the many entries, because most of the work was done by the student. 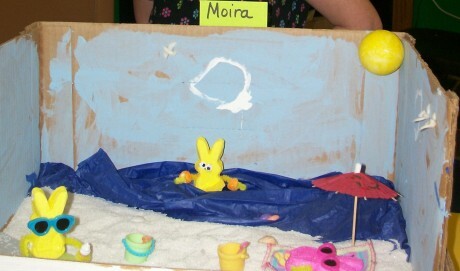 Moira's theme was "Peeping Summer Alive". Over all "Peep-Orama" Winner and First Place "Peep-Orama" Winner for Loveable Lions Class at Noah's Christian Nursery School - by Moira Spiegel theme "Peeping Summer Alive"
Nicholas Root and Tyler Budd; students in the Tender Tiger's class at Noah's Christian Nursry School proudly display their "Peep-oramas". The "Peep-oramas" were made as entries into a family "Peep Diarama" contest put on by the preschool. All of the Dioramas were then put on display at the Fulton First United Methodist Church at their annual Easter Egg-stravaganza. Attendees at the Easter party voted for their favorite "peep-orama". Nicholas' "pepp-orama theme was "Peeps go Hunting", Nicholas loves to hunt and fish and have fun. Nicholas is very proud of his acomplishments in school. Tyler Budd said, "I really like Sponge Bob, that's why I made him." Tyler also loves to play with truck and share with his friends while he is at school.